While not everyone would identify themselves as an animal lover, a vast number of other people openly admit to loving animals more than people and will dedicate large portions of their time, effort, and money to doting on furry little friends. Terry Lauerman, age 75, regularly goes to his local animal shelter in Green Bay, but he does more than simply pet a few animals. Lauerman takes his daily nap at the animal shelter rather than doing so at home on his own couch! “He just walked in and started brushing,” Feldhausen explained to HuffPost, also mentioning that Lauerman had no original intention of becoming a shelter volunteer. 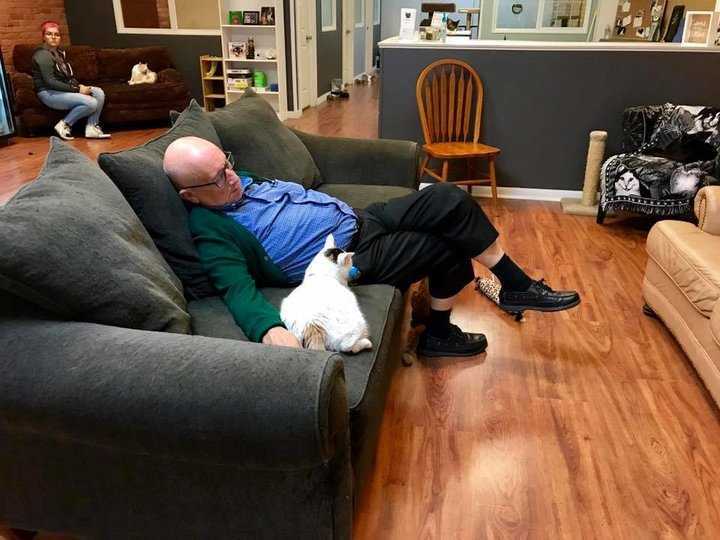 “So eventually we told him he was an official volunteer and had him fill out our volunteer form.” Once he was an official member of their volunteer staff, not only was Lauerman welcome to visit the shelter daily, but he was also expected to fulfill his cat-loving duties. SAFE HAVEN PET SANCTUARY INC.
How Does The 75-Year-Old Volunteer Feel About His Volunteer Position? Read Next: Retire At 55 And Live To 80; Work Till You’re 65 And Die At 67. Startling New Data Shows How Work Pounds Older Bodies.